Your Achilles tendon is the tendon that connects your calf muscle to your heel bone. Its function is to raise your heel off the ground to assist with walking, running or jumping. Sudden, forceful movements such as those in sports may stress the Achilles tendon and make it stretch too far, causing a partial tear or rupture. In treating this injury, it is important to provide support to the tendon while it heals. You should rest as much as possible in order to keep weight off your tendon, but can help ease pain and reduce re-injury with proper wrapping. Cut strips of athletic tape and apply them horizontally across your achilles tendon. Place three or four strips of tape perpendicular to your tendon starting at the top of your heel and ending about one-third of the way up your calf. Place two strips of tape parallel to your tendon on each side of the tendon. Each strip should start about one-third of the way up your calf and end in a loop around your foot. Circle a length of tape around your lower calf and foot. The tape should make figure-eights, alternating loops between your calf and foot. Wrap tightly, but not so tight as to cut off circulation. 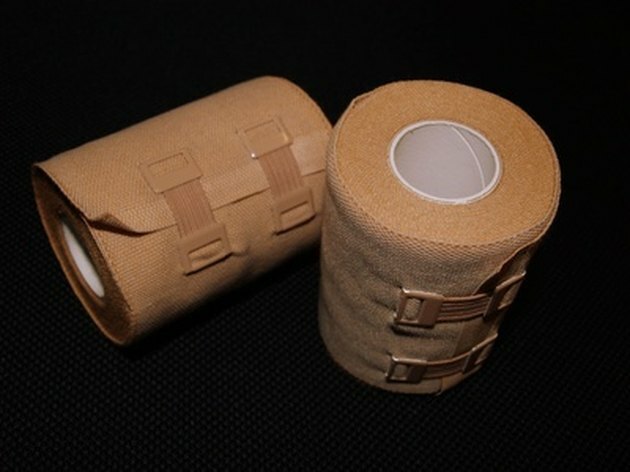 Wrap a compression bandage in figure-eights, alternating loops between your calf and foot. This additional compression will help reduce swelling. Avoid any strenuous activity such as running or excessive walking while your Achilles tendon heals. Additional stress can make your injury more severe. As athletic tape is adhesive, you may wish to shave the area of your leg and foot that you will tape. This will prevent pain when you remove the tape. The strength and flexibility in your tendon may have diminished during your injury. When your tendon has healed and you are ready to resume normal activity, start slow. Reduced flexibility will make your tendon more susceptible to another injury.